We use Radox125 Solar Cable exclusively for all Array Cabling on our solar PV systems. Unlike PVC insulation, Radox (electron beam cross linked polyolefin) remains stable and does not melt or flow when subjected mechanical pressure at high temperatures. 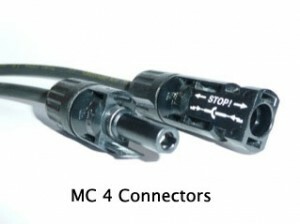 We also have precision tooling to fit genuine MC3 and MC4 connectors to our array cabling, allowing direct connection to the factory fitted leads of the PV modules. Radox125 Solar Cable is high temperature, ozone and UV resistant cable specifically designed for use in PV systems and has a life up to 8 times longer than XLPE/Rubber cables, and up to 32 times longer than PVC cables in these high temperature situations. The insulation of inferior cables used by others in PV installations has shown to be dangerously degraded in as little as 7 years, which is why quality, high temperature cabling should be of prime importance for both safety and reliability. 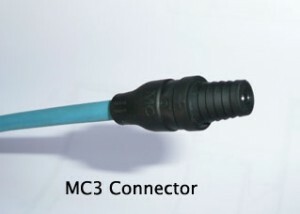 Contact Us if you require special lengths of Radox125 Solar Cable fitted with MC3 or MC4 connectors (we can make them to your exact lengths in 4mm2 or 6mm2 cable).